A typical Cornish coastal scene you could expect to see when booking Cornwall Cottages; Cornish boats outside Cornish Cottages. Cornwall cottages offers picture-perfect country cottage holidays. The county of Cornwall presents an exciting array of places to visit and offers some of the best holiday rentals around! Here you will find a wealth of country cottages to choose from in our listings of self-contained farm cottages and farm Bed and Breakfasts. All offer quality farm accommodation at reasonable rates. Cornwall has a spectacular coastline and some marvelous country scenery. A holiday in Cornwall certainly won't disappoint. Cornwall lies in the extremities of the West Country of England. The West Country probably offers a fuller range of activities, landscapes and experiences than any in Britain. The climate is mild which causes many to flock to the extensive coastline where the area becomes a summer playground and is ideal for water sports and family fun. Even better still, no part of the county is more than half an hour from the coast which gives you the best of both worlds and is perfect for Cornwall farm holidays. 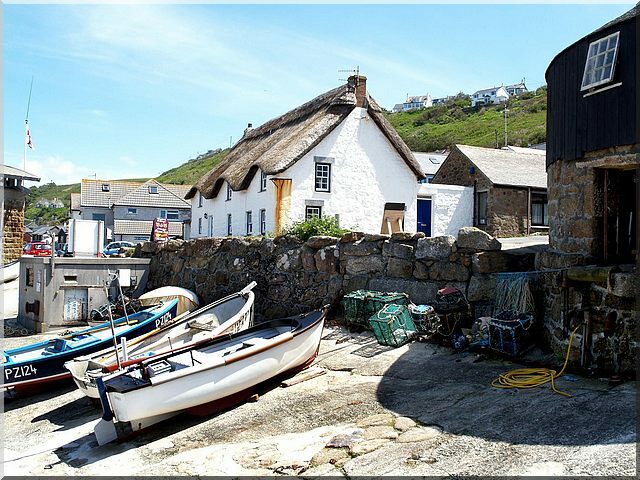 There are many Cornish delicacies for you to try during your stay at these Cornwall cottages. Try some delicious Cornish Pasties; an elongated pie filled with steak, gravy and vegetables. Something else you may find tempting is Hevva cake. It is a sweet delight filled with sultanas with a net pattern on the top. It is a cross between a scone and fruit cake and was traditionally eaten by fisherman as part of their lunch. Cornwall has always been a land surrounded by mysteries. Whether is be Tintagle Castle, legend to have been the home of King Arthur and his knights of the round table, or hide outs of smugglers along the Cornish Coast. Pepper Cove, Hayle, St.Ives Bay, Penzance and Mousehole are just a few of the many inlets and bays that were used by smugglers for their lucrative business. Book a holiday to stay in these Cornwall cottages and you will be able to explore the many hidden beaches along this coastline that no one knows about such as Portherras beach. The rock pools, cliffs, golden sands, hidden caves and crashing waves invoke images of smugglers of days gone by. Don't end your Cornwall holiday without taking a walk along the causeway to St. Michael's Mount. However, please be careful as this is only possible when the tide is out. However, if you do get stranded there are boats in the area that will take you back to the safety of the shore if you can stuck. For many, Pendeen and the surrounding area of the West Penwith represent the unspoilt West Cornwall. This is rugged country with dramatic cliffs and quiet coves, windswept moorlands and gorse and heather. This is the land of stone-age monuments, iron-age forts and centuries of tin mining. However, although giving the idea that this is an area of remoteness, more and more people are choosing Pendeen as a base to explore this wonderful area of Cornwall. Not only for the moors and cliffs, but also for the towns such as St. Just for its Tate Gallery in St. Ives and the fishing villages of Newlyn and Mousehole. There are also plenty of golf courses, riding stables and fishing spots to enjoy while staying at these Cornish cottages. Come to Cornwall and enjoy what the West Country has to offer by staying in one of our Cornwall cottages or farm Bed and Breakfasts. There is a lot of farm accommodation to choose from, and you are sure to find something that will suit your needs for your next country holiday. If you have a farm in Cornwall that you would like to showcase visit our Farm Forum. You can upload a picture and brag a little. We don't mind! Share a farming story, tell us about your best or worst farm holiday and lots more. There are other individual farming discussion boards to contribute to through this forum, as well as a Craft & Recipes Forum where you can share your favorite recipes and also get some crafting ideas for various arts & crafts. Please mention our Country Living and Farm Lifestyles website when making your farm enquiry. Feel free to browse through the books on Cornwall below. You may find something of interest for your Cornwall Farm Holidays.